I was born and raised on the West coast, Los Angeles and Portland to be exact. Portland is not a car culture city. It's idea of driving is seeing if your 1976 Volvo sedan can get you 9 miles to work and back. Los Angeles definitely is a city in love with the automobile -- Hollywood, cruising, classics, tuners, rice-boys, you name it LA has it. The Motor City is the root of America's love for the automobile and it is one of the reasons why I feel so at home here in Michigan after leaving LA back in the early 1990s. Detroit has some amazing car events and this coming Father's Day is no exception. 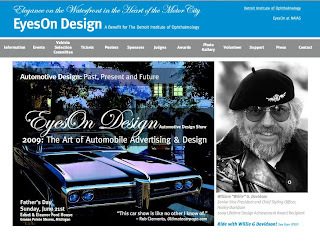 The Edsel & Eleanor Ford House in Grosse Pointe Shores, Michigan is hosting the EyesOn Design Automotive Show. This year the event is focusing on The Art of the Automobile Advertising & Design, a fitting topic for someone interested in cars and advertising. I'll be sure to take a lot of photos and share what I can next week on this blog. So, if you live in this great city, come on out to the show. At least the weather is better than the mid-January International Auto Show we host and it probably won't be as hot as the early August Meadowbrook Concours d'Elegence, another great classic car show at the Dodge Family Estate in Rochester Hills, Michigan. Times for the EyesOn Design show are 10am - 4:30pm Sunday June 21. Hope to see you there!